The top 2 pictures are found In the video of the blast in St Petersburg, Russia posted at You tube. In the video, if you look closely you will be able to see 2 distinct explosions. The second one happens 3 seconds after the original blast. Could this signature be of a thermonuclear device? Boom Boom? 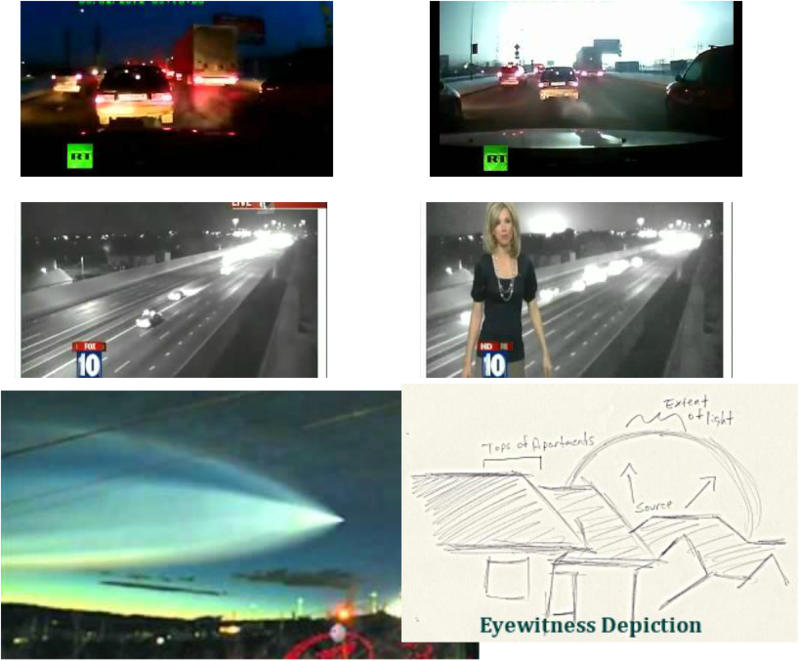 A Phoenix, Arizona FOX 10 live news report showed a similar blast. Checked for the video and it was pulled is not on you tube at this time? Last time I checked, The St Petersburg video of a thermonuclear blast is still available to see. As a speculation, What our kind elders may have done is to let the nuclear weapons be detonated by our Boom Boom crowd in Phoenix and St Petersburg, and then they vent the energy into outer space to protect us. At the 25 second point a distinctive Boom is heard, and at 26 seconds, another Boom is heard. In the pictures above, the large plume in the sky next to the hand drawn diagram, does that picture possibly resemble a slow burn off of a nuclear warhead? That was over China. Below is a picture of an object burning in the sky above Warren, Michigan. The two pictures right below were taken of an object burning in the skies above Sacramento, California. Could you ask yourself, "is this fiery object passing through the skies over China a nuclear warhead that is slowly being burned off? Who would have such capability to take a nuclear weapon into control while in flight and burn it off? Can we recognize that God our Father has sent the angels to protect us from nuclear war? Are we considering that these could be nuclear weapons that have been hurled upon us? 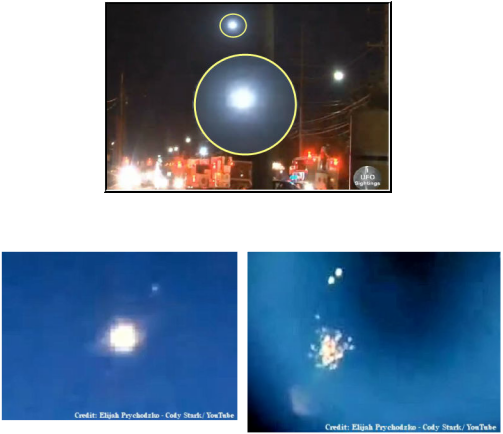 Below is a picture of the most recent fireball in the sky passing over the East Coast of America Friday March 22, 2013. The video reveals 2 distinct flashes of light, a few seconds apart as the fireball passes overhead. Could This not be the signature of a thermonuclear weapon? Boom Boom?At the top center is the fireball. Here is a link to a video to see for yourself. Here is another link to a video of the fireball. 1 flash of light can be see as the Fireball passes. 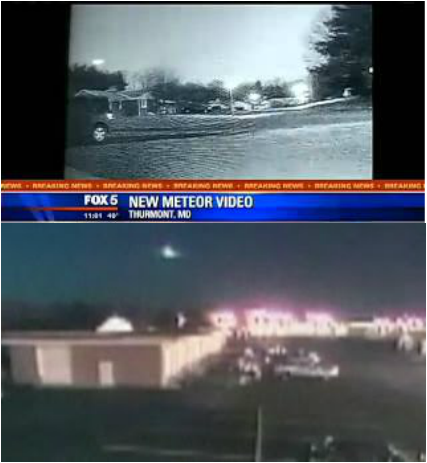 Here is a link to a real clear video of the 2 flashes of the fireball that passed over the East coast March 22, 2013. Can we not appreciate that we have been spared from nuclear war by our Father who loves us? Can we not understand why we must bring war to an end, why we must make peace? How could nuclear weapons be detonated in a city such as Phoenix, Arizona and St Petersburg, Russia without leveling the whole town? What has happened is that our elders from space have vented the blast and heat energy into the 5th dimension, the background of space, to spare God's children from the effects of these nuclear weapons. Our planet is traveling at 559.4 miles per second through space. The static field is used to transfer the heat and blast energy as the weapon explodes and burns over 6 seconds. To help understand the dimensional aspect I have written a book that includes the Four Elements of Free Energy. It includes a more detailed explanation of the dimensional barrier. You may read it for free at this link.